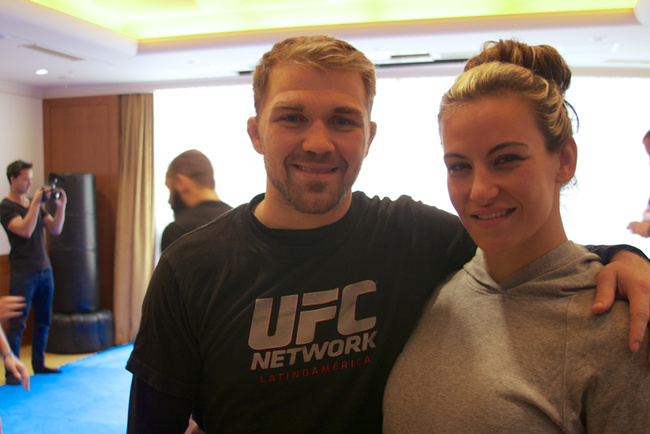 I was able to sit down for a few minutes with Miesha Tate before her fight with Rin Nakai last weekend in Japan, and we talked about how far she has come, from the reservations of Washington State, fighting for free in unregulated spectacles, to fighting for the title on the largest Pay-Per-View event the UFC has ever held, as the co-main event with Anderson Silva vs. Chris Weidman. She has been involved in some of the best scraps between two women the MMA world has ever seen, most notably with Cat Zingano and Ronda Rousey, and her fight with Nakai was another historic moment: the first women’s MMA fight televised across Japan, and the first time women’s MMA raised real interest in a nation that has been producing mixed martial artists for decades. At this point, back to struggling up the division’s ranks to get another shot at the title, Miesha isn’t sure her legacy is what it should be quite yet. Miesha told a couple hellacious stories, brushing them off for this interview. The one about her very first fight in 2006 at a convention center on a reservation in Wenatchee, WA, when “I basically got my face kneed off” and had to convince her mom that it was ok, the broken nose would heal, and it would be better to just go home than spend what little cash they had in the emergency room. Or the one about her fight with Jan Finney in 2007, one of WMMA’s big stars at the time, that flummoxed the judges after three rounds, so they had the two ladies go at it again for a fourth round. Exhausted and still waiting for the judges to figure it out, Tate and Finney had to accept the referee’s decision to settle matters. The excitement was short lived. This was a tournament and after thirty minutes icing her beat up legs and trying to catch a breath, Miesha was back in there fighting Kaitlin Young, which ended when Kaitlin “baseball bat kicked me right in the face”. Today we remember Miesha best for not tapping to Ronda’s first armbar, and then looking promising as hell in the second match-up until someone whispered “take her down!” in her ear. We remember her pushing Cat Zingano’s face into the mat and then eating knees on the way to a TKO loss. Miesha has a lot more history to look back on than the average fan, though. Most WMMA fans jumped on the wagon when Ronda fought Miesha in Strikeforce—and perhaps even much later. Few know anything about fights on the res with no cash payouts, or the beer bellies hollering at the girls in there trading knees, treating the women’s fights like it was glorified mud wrestling. So for Miesha traveling the world, experience the ride from Yakima to Tokyo, fighting her idols, on the same card as her idols, is pretty satisfying. Because she’s still the cute wrestler girl from Yakima, with the same boyfriend.